be ingested, wreaking havoc to the digestive tract. your pet. See our list of Toxic Plants. to pets. Remember to caution visitors against giving your pet "special treats." candles unattended for their sake and for the obvious fire hazards. 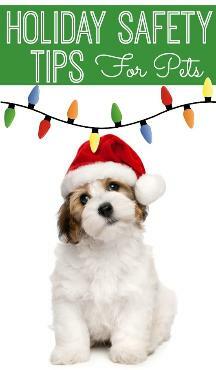 · Decorations -should be carefully placed so that the pets can't pull or scratch off any small pieces to swallow. keep your pet on his regular schedule for feeding and exercise and be sure the pet gets plenty of love. from inhalation can occur if spayed directly in the mouth. ingested, intestinal obstruction and choking are potential problems...please don't use. · Gift ribbons and bows – Keep them out of sight to prevent chewing and swallowing. Holiday foods we enjoy cooking and eating can be a problem for your pet. condition often require hospitalization for treatment. by the sweet taste of drinks, especially eggnog. because dogs love its flavor. Problems from ingestion range from diarrhea to seizures and death. candy should be placed out of your dog's reach. your pet's, wash utensils that have been in contact with raw meat, and cook meat thoroughly. toys, and hardened, sterilized bones would be better alternatives. ashtrays frequently since cigarette butts contain about 25% of the total nicotine in a cigarette. rupture of the stomach or intestines. 'linear string foreign body' in the intestines. fat trimmings, bones, and pieces of ribbon or tinsel. Feed your pet(s) before a party so they will not be so apt to beg or steal food. sanctuary care for abandoned, abused and homeless toy breeds. Focusing on shelter dogs and breeder/mill dogs. are focused on family, friends and Cheer!